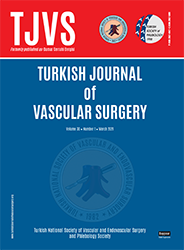 2Department of Cardiovascular Surgery, Ministry of Health, Nevşehir State Hospital, Nevşehir, Turkey DOI : 10.5606/tjvs.2017.5 Objectives: In this study, we aimed to evaluate the results of surgical treatment methods for arteriovenous fistula (AVF) aneurysms. Patients and methods: A total of 29 patients (14 males, 15 females; mean age 67.4±13.4 years; range 28 to 73 years) who underwent surgical repair for late aneurysmal complications of AVFs at our center between January 2013 and September 2016 were retrospectively analyzed. Access route, aneurysm characteristics, anastomosis type, age of fistula, diameter of vein and artery, and access status were evaluated. Results: All patients were treated for true or false aneurysmal complications. Different techniques according to the complications were used; however, the most common method was ligation and excision with a rate of 96.5% (n=28). No significant complications during or after the procedure occurred and no mortality was seen at one month. Minor complications occurred in two patients with small hematomas. The median follow-up was 28 (range, 3 to 41) months.